The max. working temp. is up to 1550c,and 2200c is also possible if required. Effective Space from 250*250*500 to 600*450*1200. Rapid cooling:6 hours from 800c to 60c. It is designed for debinding and sintering of green parts. 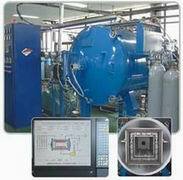 Combination of the tight graphite box and proper vacuum pump makes the furnace inside and evacuation system clean. N2,H2,CH4,Ar,CO gas can be introduced into the tight box so that binder is removed with it or to adjust the sintering C-climate. Rapid cooling function reduces the cycle time. Automatic control, friendly communication interface, easily handled.